As I type this, I’m finishing up a 6-day trip to Mexico. For the first few days here, I couldn’t find the shampoo & conditioner that I had packed. (It was tucked away in the suitcase.) I ended up using the hotel shampoo and conditioner. That, on top of the extra exposure to my hair has totally ruined my hair for the last few days. It’s normally not that high maintenance but I’m really missing my hair products at home and know I’m going to need some serious repair when I get back stateside. 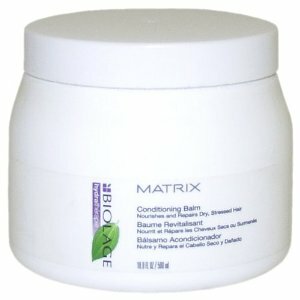 I just ordered myself a tub of Biolage Conditioning Balm, which I had used years ago. For extreme sun exposure and other hair damage, this product is the bomb. (Sorry for the pun but had to do it! Ha!) Seriously, if you want to give your hair a quick shot of something healthy for a boost, check out this Biolage Conditioning Balm from Matrix (Amazon, $20.96+, depending on the size). I’m praying it will work as it used so and help my tangled, straw-like hair that has emerged on this trip! My hair has taken a beating this summer. Thanks for the tip. I always use their detangler as well. Fabulous product!! !